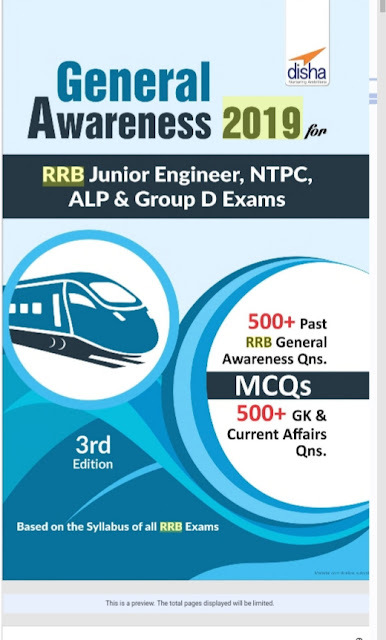 The 3rd Edition of 'General Awareness 2019 for RRB Junior Engineer, NTPC, ALP & Group D Exams is the one step solution for General Knowledge & Awareness for the Railway exams aspirants. # The book has been thoroughly updated and now covers 500+ questions from the recent past papers of various RRB exams. # The book also covers 500+ MCQs on GK, Railways & Current Affairs. # The book now covers 2 New Chapters on Environmental Issues concerning India & General Scientific & Technological Developments. Note = This books is only for demo...if u went read more then buy this book.